Hey guyz, so here it's the another Awesome tasty offer on Maniarrs khakhara, a gujarati tasty snakes, now you can buy from any state and here's the 25% discount coupon too. I personally bought this snakes from amazon and they are too good to taste. 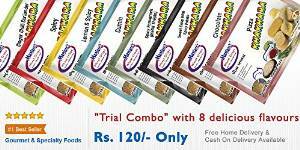 The price for 8 Packets of Maniarrs khakhra is 120 Rs, but with the coupon you can buy in just 90 Rs, with free delivery. Apply the Coupon GET25OFF on the payment page. This coupon GET25OFF only works once, so buy 2 if you already like this product taste. But, you can again get the discount from using another amazon india account. you might also like : Secret trick to Get 100 Rs gift voucher on 300 Rs shopping on amazon.